Massive mashups. Titanic Tussles. Cosmic Conflicts. And now, get ready to RUUUUUMMMMBLE as the new 2016 Honda Odyssey squares off against the 2016 Chrysler Town & Country in “The Ultimate Battle Of The Minivans.” It’s gonna be HUGE! So who will reign supreme in this automotive pugilistic slugfest? Let the battle begin! The 2016 Honda Odyssey for sale in Phoenix at your Valley Honda Dealers enters the fray flexing its muscles. Looking buff and trim, the Odyssey sports fresh new aerodynamic sheetmetal that gives it an upscale, contemporary appearance. Recently redesigned, the new Odyssey features a sleek silhouette. The 2016 Chrysler Town & Country counterpunches with an exterior that is clean and modern; although perhaps a tad dated and a bit more conservative. The battle shifts to the all-important interior. Here our two contenders duke it out where it matters most. After all, the reason you buy a minivan in the first place is to accommodate your family and all their stuff in supreme comfort with plenty of space to spare. Both the Odyssey and the Town & Country have a lot to commend themselves. Let’s take a look at the Town & Country, which offers a total of 143.8 cubic feet of space compared to the Odyssey’s 148.5 cubic feet of interior volume. Cargo volume behind the 3rd-row seat is 33 cu. ft. in the Town & Country versus 38.4 cu. ft. for the Odyssey. Flip the 3rd-row seat down and the Town & Country gives you 83.3 cu. ft. of space compared to the Odyssey, which rips it with 93.1 cu. ft. of space. 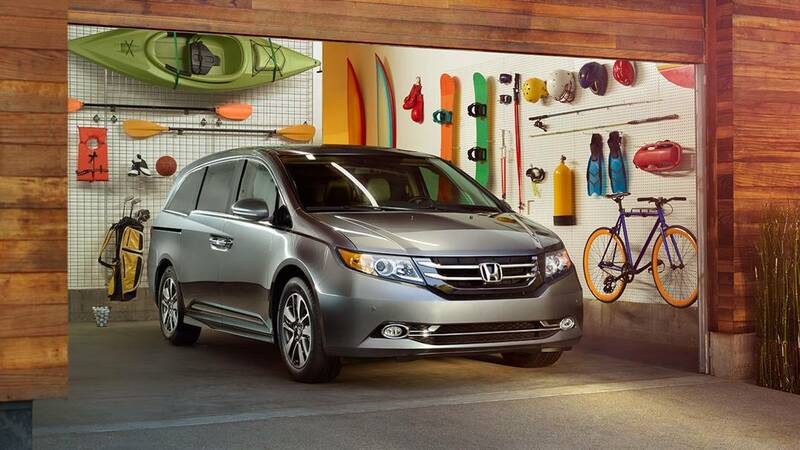 So in just about every category, the Honda Odyssey offers more room than its competitor. Both the 7-passenger Odyssey and the 7-passenger Town & Country are pretty evenly matched when it comes to versatility, flexibility, convenience features, and luxury appointments. The Town & Country features a 60/40 split bench 3rd-row seat plus its Stow ‘n Go® seating that can be configured in multiple ways. Not to be outdone, the Odyssey comes out swinging with its exclusive 3rd-row “Magic Seat® that has some tricks all its own. The Magic Seat magically folds flat in one easy motion to maximize cargo capacity. 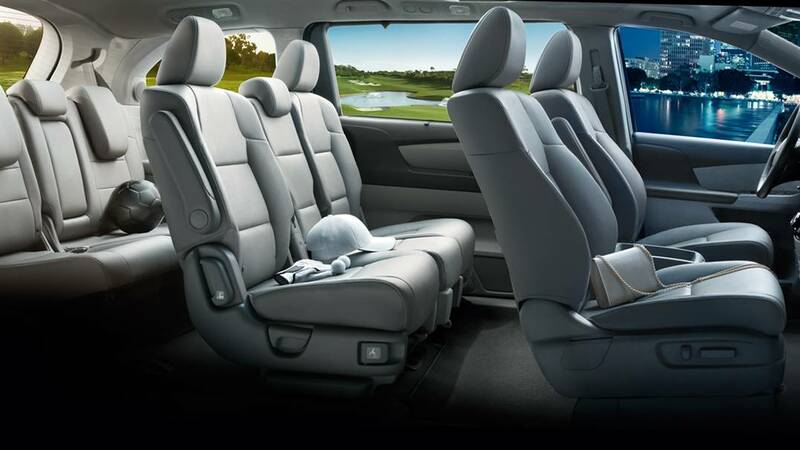 Additionally, the Odyssey offers a unique “wide mode” that expands the distance between the 2nd-row seats, which is especially helpful if your little Munchkins decide to get into an elbow-throwing contest. As you would expect, both these two champion minivans also offer an array of clever and convenient storage bins, cup holders galore, available leather seats, and other luxury amenities such as premium audio systems, power lift gates, and so forth. But there’s one convenient item that the Odyssey has which no other minivan on the planet, including the Town & Country, has. It’s called HondaVac® and it’s an answer to the prayers of any parents with messy little ones. (Aren’t kids just genetically messy anyway?) HondaVac is a built-in vacuum with a long reach, powerful suction, and a removable waste bin that makes cleaning up those myriad messy moments a snap. Whether just down the street to the mall or on a cross-country adventure, having the latest technology at your disposal is essential. The Odyssey and the Town & Country both feature an array of the latest “infotainment” technologies to keep everyone happily entertained. The Odyssey’s oversized 8-inch touchscreen “Intelligent Multi-Information Display” (iMID puts you in control of multiple functions. Wireless Bluetooth® lets you make and receive calls hands-free while the available “Streaming Audio by Voice®” lets you use your voice to control many different functions with just your voice. The iMID also shows navigational maps, a rearview camera, and allows you to access standard and available services like Pandora®, SiriusXM® Radio, and HD Radio® Digital AM & FM. A USB audio interface lets you hook up your audio device and control it either via the iMID display or steering wheel-mounted controls. HondaLink® connects you to your smartphone to search for restaurants, listen to audiobooks, and access an array of other functions. The Town & Country also offers its own suite of similar “infotainment” features as part of its UCONNECT® system. The Odyssey’s available “Ultrawide” Rear Entertainment System consists of a large 16.2-inch split screen with wireless headphones that lets rear-seat passengers enjoy DVDs or use it to play their favorite video games. The Town & Country counters with its own similarly-equipped Blu-ray™ DVD entertainment system. We’d call this one a draw. The Odyssey and the Town & Country come out slugging with comparably equipped power plants. A 3.6-liter Pentastar® V6 engine delivers 283 hp and 260 lb. ft. of torque. The Town & Country achieves an EPA-estimated 17 mpg city/25 mpg highway. When ordered with the Trailer Tow Group, the Town & Country lets you tow up to 3,600 pounds. By comparison, the Odyssey is motivated by a 3.5-liter, i-VTEC® V6 engine that generates 248 hp and 250 lb. ft. of torque. While the Town & Country bests the Odyssey in the performance department, the lighter Odyssey returns better fuel economy numbers. Specifically, up to an EPA-estimated 19 mpg city/28 mpg highway. Regarding handling, both minivans deliver confident, compliant, and surefooted rides. However, TheCarConnection.com gives the Odyssey the nod when it comes to more responsive handling. Finally, our two contenders go toe-to-toe in the all-important category of safety. Here again, both are very evenly matched. Chrysler’s available SafetyTec™ Package includes a rearview camera, rear cross-path detection, rear park assist, blind-spot monitoring, multiple dual-stage airbags and steel safety frames designed to absorb impact and protect passengers. As you would expect, both minivans feature anti-lock brakes (ABS), electronic stability control, and tire-pressure monitoring systems. The Odyssey? It also comes well equipped with and an array of both standard and available safety technologies. The Odyssey’s available “Honda Sensing®” suite of driver-assist technologies, features a standard multi-angle rearview camera with dynamic guidelines, lane departure warning, lane keeping assist, road departure mitigation, adaptive cruise control, expanded view driver’s mirror, forward collision warning, and collision-mitigation braking. The Odyssey’s ACE™ body structure, like the Town & Country’s, is also designed to absorb the forces of a frontal impact. Interestingly, the Odyssey does get better safety ratings than the comparably equipped Town & Country. We’re actually pretty surprised at this, given that both automakers have an excellent track record of producing safe and reliable vehicles. However, according to the National Highway Transportation Safety Administration (NHTSA), the Town & Country only manages 4 out of 5 stars in several critical safety tests compared to the Odyssey’s 5-star rating. The verdict? As you can see, this is a close one. Both the Odyssey and the Town & Country are excellent choices for full-featured, capable, roomy, and versatile family minivans. Of course, to be fair, you would expect your Valley Honda Dealers to favor the Odyssey over the Town & Country, and we do. But we think there’s a good reason for that. We believe that the Odyssey edges out its competitor with more interior space, a more responsive and car-like ride, better fuel economy, more innovative thinking, and better safety ratings. That sounds to us like a clear win for the Odyssey. Why not stop by a conveniently located Valley Honda Dealer near you and take the 2016 Honda Odyssey for a test drive? Then you can see for yourself why it “TKO’s” the competition.